The TRACs 4910LR-152-LTRK is a 2D Imaging Scanner which reads driver's license barcodes and captures images and signatures. 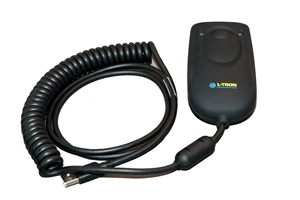 Ideal for e-citation application the L-Tron TRACs 4910LR-152-LTRK updates the 4910LR-151-LTRK kit containing all you need to install and connect the compact, radio microphone-style scanner to the USB Port of the vehicle's computer. The 4910LR is a replacement for the popular 4710LR and 4810LR series imaging scanners.